GILAS Pilipinas’ youth movement will be in full swing in the upcoming Southeast Asian Games as rising stars Ray Parks, Kiefer Ravena, and Kobe Paras will be teaming up for the first time to fly the flag in the biennial meet in August. Head coach Chot Reyes announced he has submitted on Tuesday the SEAG-bound lineup that features the young trio, along with Fil-German Christian Hardinger, who is set to arrive later in the day as confirmed by team manager Butch Antonio. Antonio added he will pick up the 27-year-old cager at the airport at 10:30 p.m. tonight. Standhardinger will show up in practice the day after. 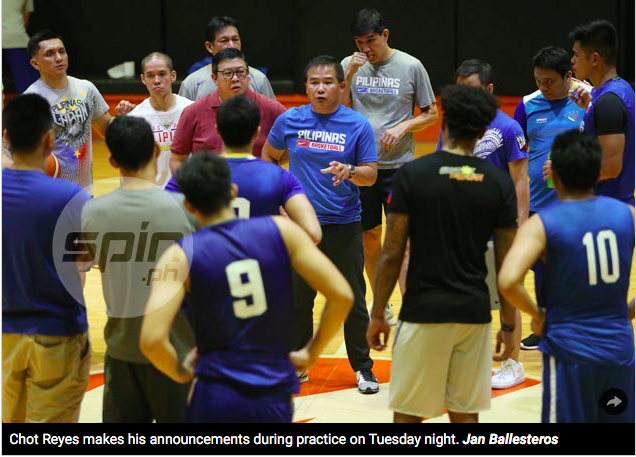 "Yes, he will arrive tonight," said Antonio during the team's practice on Tuesday at the Meralco Gym. Standhardinger will join the team which also includes Gilas cadets and PBA pros like Baser Amer, Mike Tolomia, Von Pessumal, Kevin Ferrer, Carl Bryan Cruz, Troy Rosario, Almond Vosotros, and Raymar Jose for the biennial meet. All of which, with the exception of Standhardinger and Rosario (who is playing for TNT in the ongoing PBA finals) were present in Tuesday's practice. Standhardinger, listed in US sites as anywhere between 6-7 and 6-9, will be the tallest player in a team that definitely won't intimidate SEA Games rivals with its size. Joining Standhardinger in the frontline are the 6-7 Rosario, Jose and Cruz. The team, however, is blessed with an abundance of athletic wingmen like the 6-6 Paras, Ferrer, and Parks while Ravena will join Tolomia, Vosotros and Amer in the backcourt. The team is also seeing action in the Jones Cup in Taipei next month as part of its buildup for the SEA Games, which the country has ruled for decades. Mike Myers, TNT's standby import in the PBA Finals, will be reinforcing Gilas in Taipei.